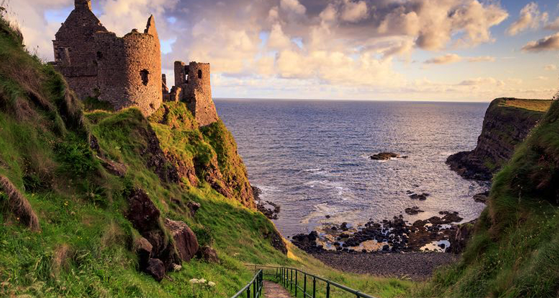 Ireland is famed for its many castles. 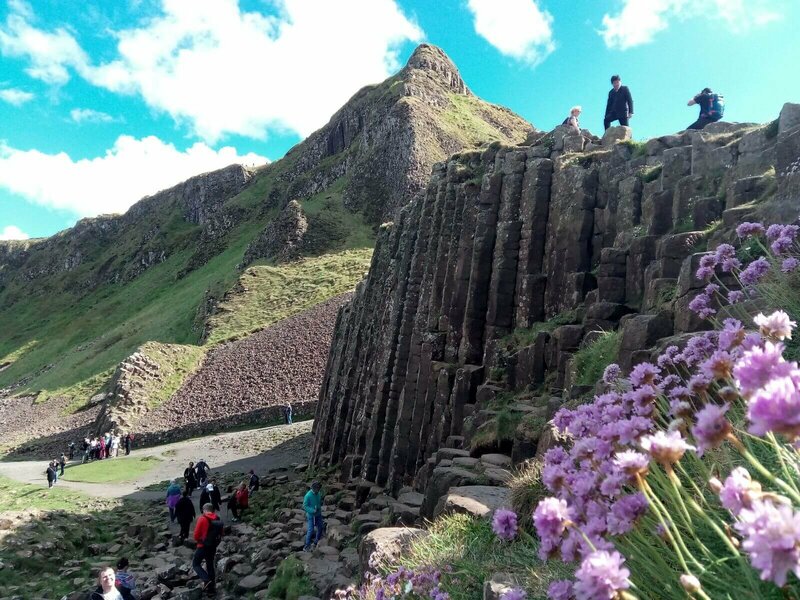 They are lasting memories on the landscape of a time when Gaelic Chieftains, Norman Lords & English Conquers ruled the land. Each leaving their mark at different times and adding to the rich historical fabric of Irish history. 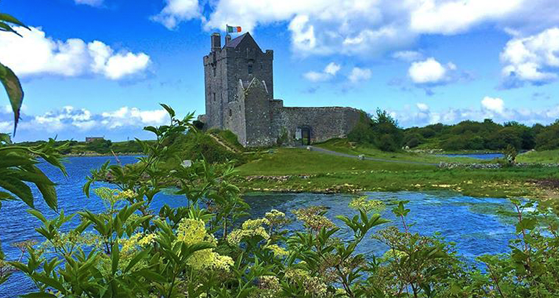 Have a look at the video of our favourite Irish castles, and read more about them below. Built: Originally; 13th century, latest structure; 17th century. Firstly the castle is thought to have been the inspiration for C.S Lewis’s, Chronicles of Narnia. 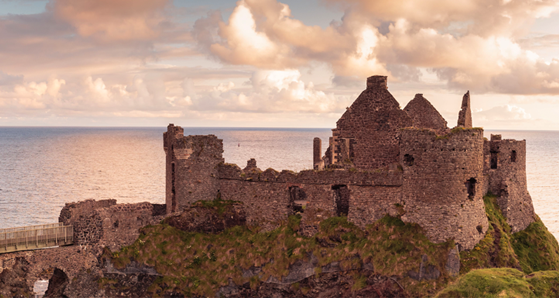 An annual fair once ran in Dunluce, but was shut down because of “excessive bawdiness and debauchery”! Over a 100-year period, the castle was besieged on numerous occasions by the English. The castle was originally built by the McQuillans. They had came from Scotland in the 1200’s as hired mercenaries. 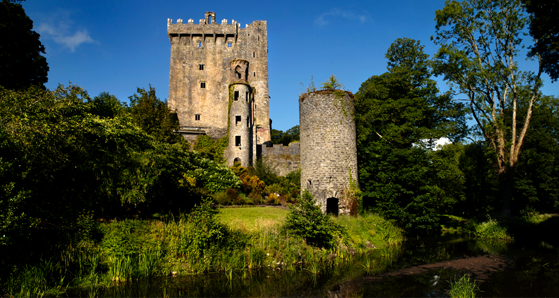 Blarney Castle – The Blarney stone firstly became known for its powers of giving anyone that kisses it ‘the gift of the gab’ during Queen Elizabeth 1 reign. The Blarney stone firstly became known for its powers of giving anyone that kisses it ‘the gift of the gab’ during Queen Elizabeth 1 reign. It was she who coined the term when she became fed up with Lord Blarney who talked endlessly to avoid agreeing to her demands. 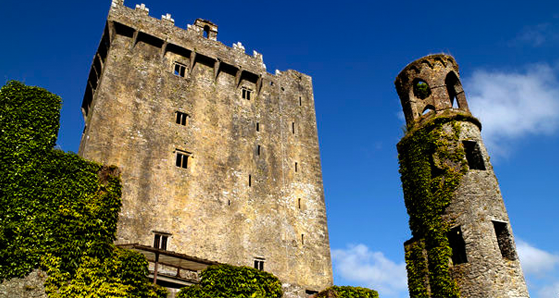 Visitors were once held by the ankles and lowered head first over the battlements to ‘kiss the Blarney stone’. Today more attention is paid to health and safety with visitors leaning backwards and holding on to an iron rail. The castle was constructed on an impressive limestone outcrop and was strategically sited so that it could overlook two rivers. 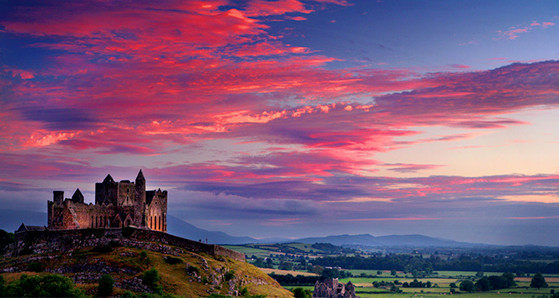 Rock of Cashel – The shamrock is thought to have gained its symbolism here. The shamrock is thought to have gained its symbolism here. When St Patrick plucked it to show the meaning of the Holy Trinity during the conversion of the King of Munster from paganism to Christianity. According to legend the Rock of Cashel appeared when the Devil took a bite from a tall mountain called the Devils bit located 20 miles away. 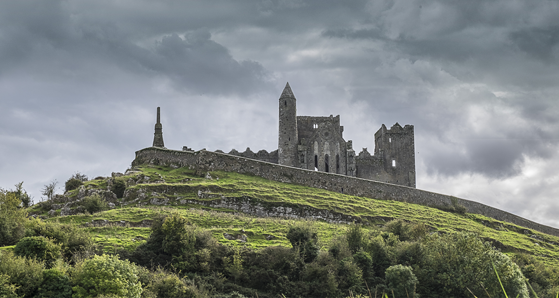 When the piece of rock fell from the devil’s mouth it became the rock of Cashel. Furthermore if you translate Cashel from Irish it means circular stone fort. Dunguaire Castle – At the start of the 20th century Dunguaire Castle became a meeting place during the Celtic revival, with literary greats such as George Bernard Shaw and W.B. Yeats meeting there. 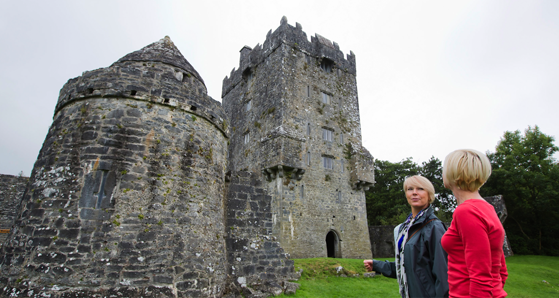 At the start of the 20th century Dunguaire Castle became a meeting place during the Celtic revival, with literary greats such as George Bernard Shaw and W.B. Yeats meeting there. The castle was built by the Hynes clan around 1520, a family who may have been associated with the area since around 662AD. In addition to the history, legend has it that if a person stands at the front gate and asks a question, their question will be answered by the end of the day. 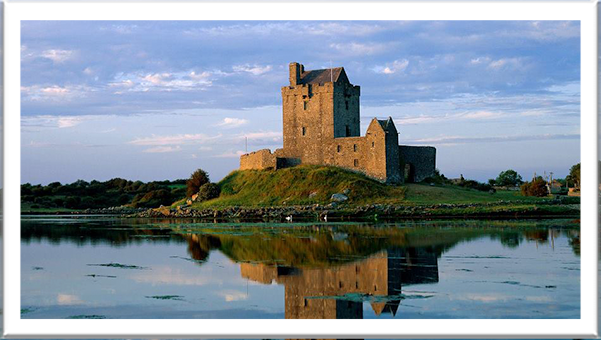 The castle stands on the shores of Lough Corrib in Galway. Built by the O’Flaherty clan their motto was “Fortune favours the strong”. In 1546 Donal O’Flaherty married Grace O’Malley, who would go on to be known as the Pirate Queen. Aughnanure Castle -Built by the O’Flaherty clan their motto was “Fortune favours the strong”. 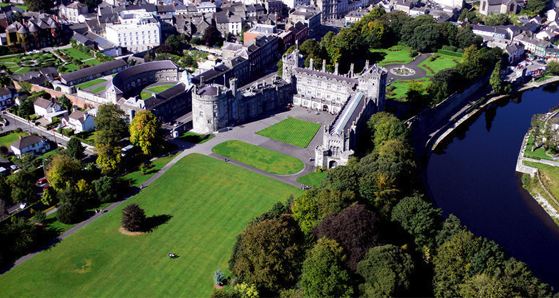 In 1967 Kilkenny Castle was sold to the state for £50 from the last and sixth Marquis, Arthur. Strongbow who lead the Norman invasion of Ireland in the late 12th century built the first Kilkenny Castle, which was probably made of wood. Strongbow’s daughter Isabel and husband William Marshall rebuilt Kilkenny Castle as a stone structure. Kilkenny was once the capital of Ireland for a time during the 17th century before the Cromwellian conquest of Ireland in 1649. 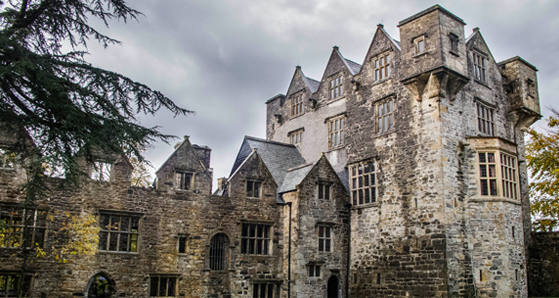 In 1385 the castle was bought by the Butler family, and remained theirs for over 500 years, until in was bought by the state in the 20th century. 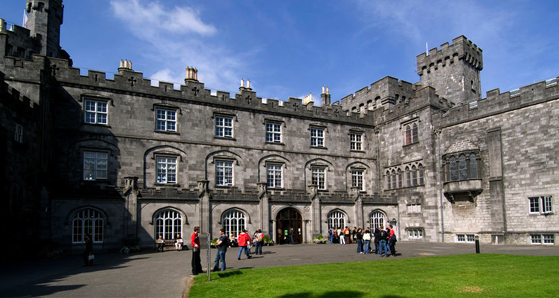 Kilkenny castle – In 1967 Kilkenny Castle was sold to the state for £50 from the last and sixth Marquis, Arthur. 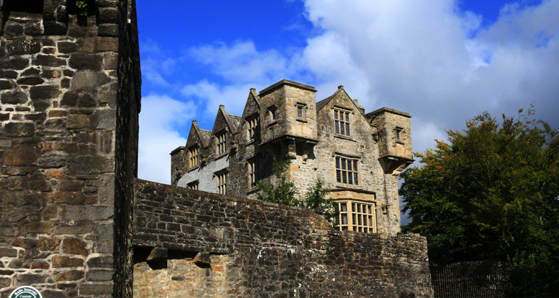 Donegal Castle was the seat of the O’Donnell’s. One of the most powerful Gaelic Irish families from the 5th -16th century. In 1607 the O’Donnell’s fled Ulster after the 9 year battle with the English rulers in Ireland. 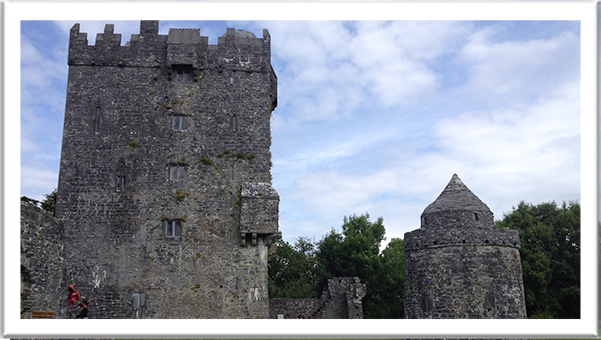 The fleeing O’Donnell’s damaged the castle, so it couldn’t be used against the remaining Irish chieftains. The castle fell into the hands of Captain Basil Brooke, who restored it and gave it windows. The castle was sold to the Gore’s in the 1670’s, under their rule it fell into ruin in the 18th century. It was vested into the care of the office of public works in 1898. It wasn’t until the 1990’s that the castle was partly restored. 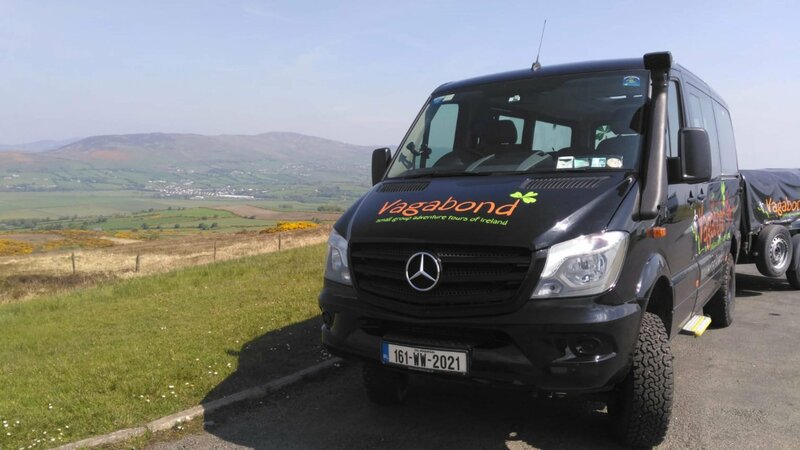 If you want to get to know more about Irish castles, get in contact directly with us today: info@vagabond.ie. 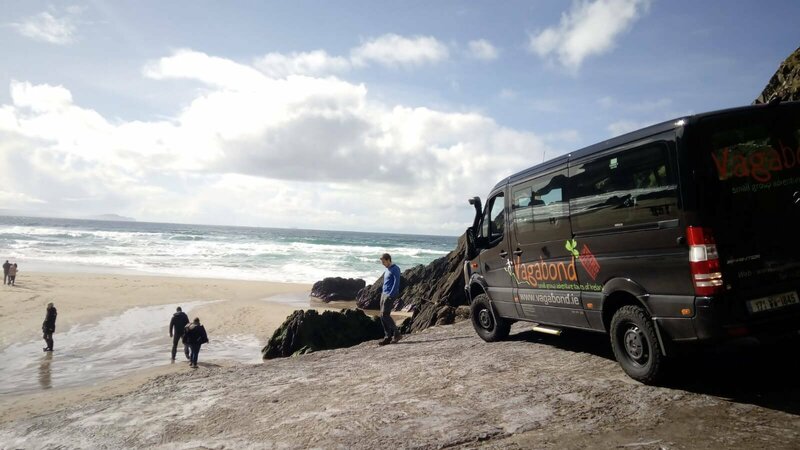 Our friendly reservations team will be more than happy to inform you about our amazing castles and tours that visit them.